California Goldenrod is a keystone plant in many communities, offering nectar to butterflies and other native pollinators, and seeds for birds. Aesthetically, it provides a welcome splash of bright yellow color to the garden, flowering from late summer through autumn, at a time when other flowering natives are just about winding down. Light green leaves are low growing to 2’ tall, with stalks bearing small clusters of yellow flowers rising up another foot in late summer. California Goldenrod prefers full sun, but can make do with part sun or light shade, and also tolerates a variety of watering conditions, going from very moist conditions in spring to near drought tolerance in autumn. Giving supplemental water during summer extends its blooming period. 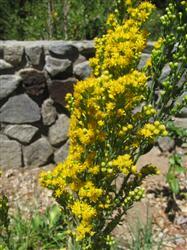 California Goldenrod is a good choice for erosion control, as it grows with a spreading habit by rhizomes that is easily controlled if need be. It is deciduous, so cut back in winter once flowering is done. A great choice for borders and wildlife gardens, it blends in well with salvias to welcome birds and butterflies.